« What’s Brown And Steaming And Comes Out Of Cowes? 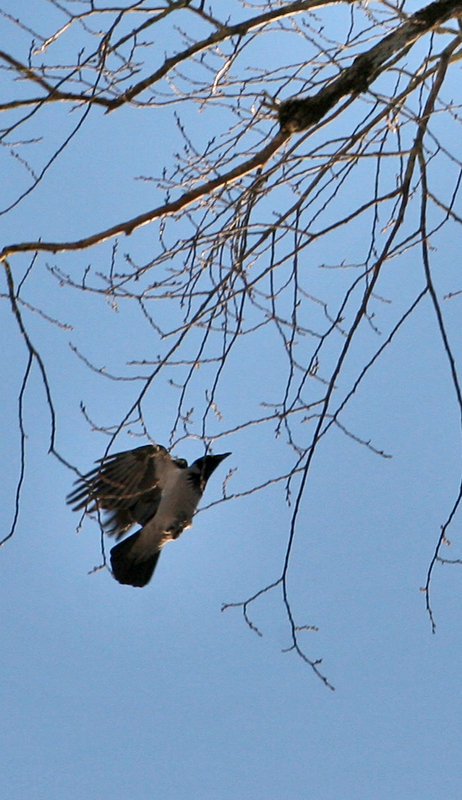 I enjoy watching the crows and magpies that live around here. For one thing, I love the way they look; for another, I love their anthropomorphic behaviour. You can imagine what’s going through their mind, though I don’t see it at all like Ted Hughes did. The magpies are very timid in human presence, but the other day one hopped up the ramp to the out-house and started tapping with its beak on the glass doors: it had seen some oats that were lying scattered on the floor just inside. I threw some outside; there’s not much to eat out there in this weather. It’s warmer than it was, though: -10-ish, that’s +14 in F.
“the huge flocks of crows that gather at dusk..”: maybes. But call to mind the ancient wisdom that one rook is a crow but a gang of crows is a bunch of rooks. 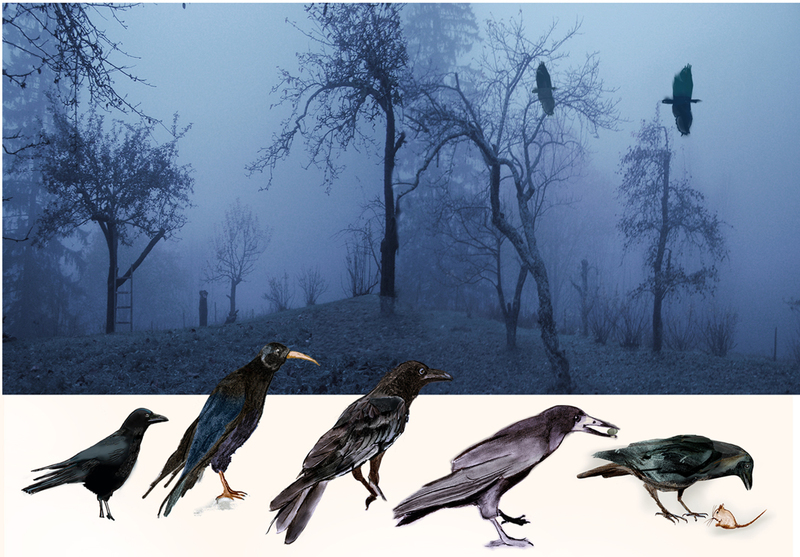 I was wondering where the two crows displayed on this blog’s front page had gone. We have more and more crows on Mars. They apparently arrived on board Taiwanese ships some years back. I can’t help finding the noise they make quite unpleasant. Apparently they make around thirty different noises. Yes, I learned that too. A rook on its own is a crow; a crow in a crowd is a rook. These are not rooks, they are Hooded Crows. Ah, the hoodie: I admit to having been briefly puzzled when “hoodies” appeared in the English newspapers as a new urban menace. Mind you, I was puzzled when we moved south to find that “Pakis” were persons rather than corner shops. They have an odd way with language, the English. They’re known as hoodies, in Scotland? The Wikipedia map shows the hoody being found as far away as the Pakistan border (where they run corner shops). In parts of the US a packy is a sort of shop: a “package store”, i.e. a shop that sells alcoholoic beverages but not for consumption on the premises. “They’re known as hoodies, in Scotland?” Aye. And the “cushie doo” is the wood pigeon, which seems to me to sound almost onomatopoeic, though it ain’t. My, my. This seems to me to be Going A Bit Far. “Hoodies” are apparel here, but they are also an urban menace. That’s nice, there’s a Scottish Wikipedia. Pigeons and doves are all duer in Norwegian, which sometimes leads my wife to describe the birds in (e.g. ) Trafalgar Square as “doves”. When they were younger, my daughter & her best friend stopped speaking for some days when they argued over whether a bird they’d seen was a wood pigeon or some other kind of pigeon. Now that is Going a Bit Far. Interesting, that’s what they do on the Norwegian side of my family, I suppose it replaces the blood feud. A few days though?–the Nijmassens manage it for years. When my nephew was very young and interested in such things, he once saw a bulldozer through the car window and pointed it out to his parents: “Bulldodo!” Except that it wasn’t exactly a bulldozer. One parent corrected him: “Actually, Nathan, it’s a front-end loader.” The kid insisted on bulldodo. Both parents continued to calmly voice their disagreement. The poor kid got more and more exercised about it, eventually bursting into tears. At this point the (sensitive, caring, intelligent) parents finally snapped out of their attachment to getting the facts right and remembered that sometimes other things are more important. I’m curious, how old were Coronella and her friend at the time, and what did it take for them to get past the pigeon ID impasse? There’s a difference between (1) having an argument that goes on for a long time and (2) having an argument that leads you to not speak to each other for a long time! I meant Nr.2. Anyway A.J.P blew it way out of proportion, and we were on speaking terms very soon after unpleasantness revealed its ugly head. Apparently the friend thought the bird they saw was one of these; my daughter still maintains it was a woodpigeon. Of course pigeons, such as the ones in Trafalgar square, are rats with feathers, whereas doves are symbols of peace and love. Same bird, different image. “Dove”, with its many cognates, goes back to a word meaning “dive” or “swim”. So does the unrelated genus name “columba”. What’s going on here? Apparently these birds fly in a way that is reminiscent of swimming or diving. There is also a bird called “diver”, but that’s a whole other thing, what Americans call “loon” — it actually dives underwater, of course. Here is a horribly mixed up paragraph on the etymology of “loon”. Interesting that loon and lunatic may come from the same root as lame, or Norwegian lamme (paralysed), and not lune /moon. Saint Columba (7 December 521 – 9 June 597 AD), also known as Colum Cille (meaning “Dove of the church”) (Norse name: Kolbjørn, meaning black bear (cave dweller), or Kolban) was an outstanding figure among the Gaelic Irish missionary monks who, some of his advocates claim, introduced Christianity to the Picts during the Early Medieval Period. No wonder these things get complicated; some people are saying “dove” while others are happy with “black bear”. You yourself made those crow drawings ??!! Yes, I did. I can only find two of them, I’m not sure where the others are. I’ve seen some wonderful bird drawings done by artists whose other work isn’t that great. There’s something about the subject. It may just be that drawing the anatomy convincingly isn’t much of a problem: it’s just feathers, a beak, an eye and the two sticks of feet. There’s only the sheen and colour to worry about. A friend of ours (an architect) isn’t crazy about wildlife. She was doodling birds one day, and couldn’t figure out what was wrong with her drawings, until her daughter pointed out that birds have two legs, not four. I’ve seen them, they’re very nice little drawings. They have four legs, don’t they ? It’s just that they use one pair of them to fly. Earlier attempts by men to fly usually involved flapping their arms. It was only when someone thought of using the muscle power in the other pair of limbs that flight became possible. Flapping your legs is also called pedalling. Angels are always depicted with huge wings on their shoulders. But maybe they actually don’t need them, since they can walk on air in their wing-tipped shoes. Hermes had wing-heeled shoes. I’m saying that I don’t know what I have done with the other three originals. They must be in the out-house somewhere, unless someone ate them. Flies have six legs, plus wings. Don’t they? I checked the WiPe on “fly”. There is a lot on the wings, but nowhere does the article tell you how many legs a fly has. There is more than enough detail about the presence or absence of legs in the maggots, but nothing about the adult insects. Apparently this is something most people know, so the article doesn’t bother to tell you. I had to inspect the pictures. It seems you’re right about six legs. But wait: why are we now talking about flies, instead of birds ? Perhaps you didn’t trust my information about four-legged birds, and are checking to see how much I know about flies ? Pedal flight was demonstrated towards the end of the film E.T. Why are we now talking about flies, instead of birds ? A fly can’t bird, but a bird can fly. Ask me a riddle and I reply “Cottleston, cottleston, cottleston pie”. Ah, I just knew that “ask me a riddle and I reply” sounded familiar, but couldn’t place it. You’ve had this bird/fly confusion before, then? I wish I could answer that with an honest glare. Hat’s latest blogpost links to an effusively bathetic post on James Agee. The blogress says his prose shows “glaring honesty”. I’m not sure how I would react if an honest person glared at me, but it does sound rather discomfiting. I think the blogress intended it as praise. I hate people who glare at you while they’re acting honest. Give me a shifty-eyed honest-to-goodness liar any day. Now I’ve got to look up the difference between James Agee & James Agate, who was British. Well, for one thing, James Agee was better looking. Where did you find photos of them so quickly? The English WiPe has no photos at all. The reason I can’t give you an honest glare is that I could manage only the glare. I can’t do honesty without feeling giggly and manipulative. Google images appear when I google. What kind of images appear when you giggle? Insects (in their adult or imago forms) are reliably six-legged. “Insect” could be considered almost synonymous with “six-legged arthropod”. But of course if you take that view then the question just becomes “are flies insects, or do I just think they are”? Stu, you can’t use words like “blogress”. And I don’t mean that it should be spelled “bloggress”. As I think about the word “glare” and look at what some dictionaries say about it, I see that it covers some interestingly varied territory. I think that the “angry look” sense and the “harsh light” sense and the “glaring error” sense may have been driving out some other more negative senses or usages. Is this about the riddle? In my view, it should be “six-legged arthropod (not including wings)”. Yes it’s about the riddle. It’s not about life in general. The bird wing and the bat wing are evolutionarily related to our forelegs, but I don’t know if the (typically two pairs of) wings of an insect are similarly related to arthropod legs. Well, it could have been about the spelling of “blogress”. A garbage truck. Old US riddle, used to be universally known over here, maybe still is — though on reflection most garbage trucks probably have more than four wheels. Then the riddle should be: “what has at least four wheels and flies ?”. Why can’t I write “blogress”, meaning blog ogress ? I don’t live in the States, so no one can prosecute me for inciting anti-wimmininity. Oh I was thinking it must be the other kind of flies, like What has two legs & flies? A pair of trousers. It wouldn’t be pronounced like ogress, that would be blow-gress, whereas this is blogg-ress. Sigh. It was supposed to be a PLAY ON WORDS. Ostensibly the female form of blogger, but THE SENSITIVE EAR also hears ogress. Maybe not a good play on words, but there’s no pleasing you today, it seems. You’re frisky as a goat, while I labor at the rock-face of mild-mannered conciliation. You can’t evade the law that easily. This is a tricky case. In my book one can be charged with anti-wimmininity for using the word “poetess”; and with aggravated anti-wimmininity if you use the word in the course of making derogatory comments about a particular lady poet’s work. The same applies mutatis mutandis to “actress”, with an exception for the Academy Awards. It would also apply to a new coinage like “blog(g)ress”. I’m not sure it would apply to “ogress” at all — I suppose because ogre(ss) is not an occupation. Of course, it would not apply to “princess” either. Hmm, what principles am I basing this on, if any? In any case, now that I know that it was a play on words I’m inclined to let you off with a warning. I only brought this up at all to save Nijma the trouble. Or to try to stir up a little trouble. Or something. I don’t really know why. What has two legs & flies? A pair of trousers. Flies, in the plural? I once had a contract to make ten pairs of trousers. I only made one fly for each pair, and nobody complained. I wouldn’t have known how to make two or more flies. I know, I know ! A baseball team. Crown isn’t taking me seriously enough, while empty is taking me too seriously. I’m going to have to play my last trump: today is my birthday, so you guys be nice ! marie-lucie has raised a nice point. I seem to remember that the plural “flies” is in use somewhere, but perhaps only in Britain ? This is not in the biblical sense, I hope. Happy birthday! January 16th or 17th? It is still the 16th in Canada at the moment, Grumbly, although it is the 17th for you already, but enjoy whatever day it is! The 16th. Many thanx ! What has two legs & flies? Did you hear the one about the guy with five, …um…thingies? His pants fit him like a glove. It’ s supposed to be “what has four wheels and flies?” Answer: a garbage truck. Grumbly, Many Happy Returns of your birthday! I ought to have known, I did know. Belated birthday wishes from moi as well! To think that it was around this time last year that I first stomped into Hat’s living room. One whole year of grumbling and griping, and what good has it done ? Have souls been saved, or mindsets unsettled ? I think not. That’s what my wife says. She thinks we just like the sound of our own voices. Grumbly: Have souls been saved, or mindsets unsettled ? I think not. How can you tell? Remember the phrase about the butterfly’s wings … (sorry, perhaps someone will remember it).